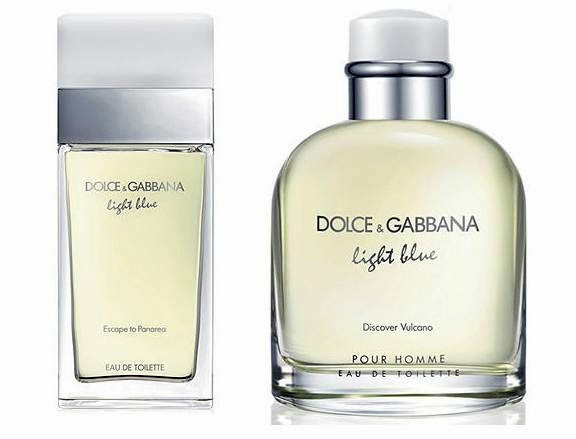 Dolce & Gabbana presents 2 new fragrances for her and for him in the Light Blue family, both launching for Spring/Summer 2014. Light Blue Escape to Panarea is the new fragrance for women inspired by the island of Panarea. The new scent has notes of pear, bergamot, jasmine, orange blossom, ambergris, tonka and white musk. Available as 100 ml Eau de Toilette. "Panarea is the smallest and the most fashionable of the seven Aeoleon Islands. It owes its fame to the Hotel Raya, which in the summer attracts the international jet-set. The terrace of the Hotel Raya is the place to be for the aperitif, and its disco keeps the island awake until dawn... Bringing the "Aeoleon mood" everywhere with top notes of bergamot & pear, heart notes of night blooming jasmine & orange flower, and base notes of ambergris, tonka beans, & warm musks." Light Blue Discover Vulcano is the new fragrance for him, inspired by the island of Vulcano, with notes of lemon, ginger, cypress, lavender, vetiver and cedar. Available as 125 ml Eau de Toilette.